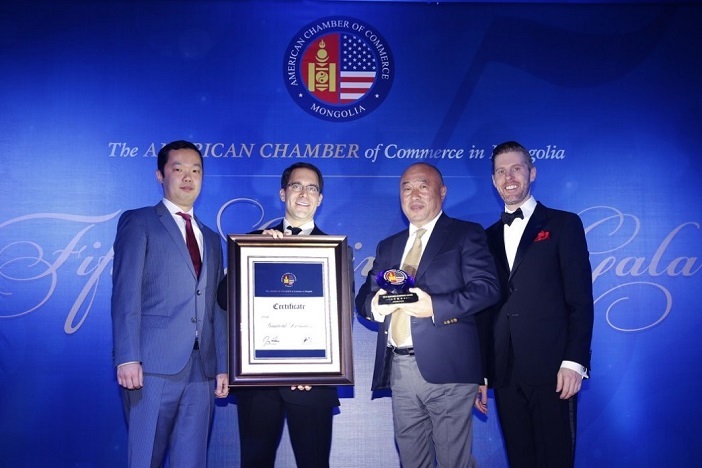 The American Chamber of Commerce (AmCham) in Mongolia presented its 2016 Business Leadership Award to Mr. Da. Ganbold, a prominent economist and board member of Erdenet Mining Corporation. This distinguished award was presented at AmCham’s Fifth Anniversary Gala at Shangri-La Hotel, on Saturday, December 10, 2016. This annual award recognizes a leader in the business community who displays a commitment to promoting private sector growth, job creation, and free market principles. The event brought together over 300 of AmCham’s members and special guests, including Chairman of the Asia-Pacific Council of American Chambers of Commerce Jackson Cox; the U.S. Embassy’s Deputy Chief of Mission, Manny Micaller; Member of Parliament A. Undraa; Canadian Ambassador Ed Jager; and Ambassador of the United Kingdom to Mongolia Catherine Arnold; as well as AmCham’s Honorary Members Member of Parliament D. Tsogtbaatar, former Prime Minister Ch. Saikhanbileg, and former Foreign Affairs Minister Ts. Gombosuren. AmCham Mongolia is an independent membership-driven organization that seeks to build, strengthen, and protect business between the United States and Mongolia and to actively promote Mongolia as a destination for American investment. AmCham Mongolia is the official local affiliate of the U.S. Chamber of Commerce, the largest business federation in the world with over 3 million member companies. AmCham Mongolia is also a member of the Asia-Pacific Council of American Chambers of Commerce, consisting of 29 American Chambers of Commerce in the Asia-Pacific Region.